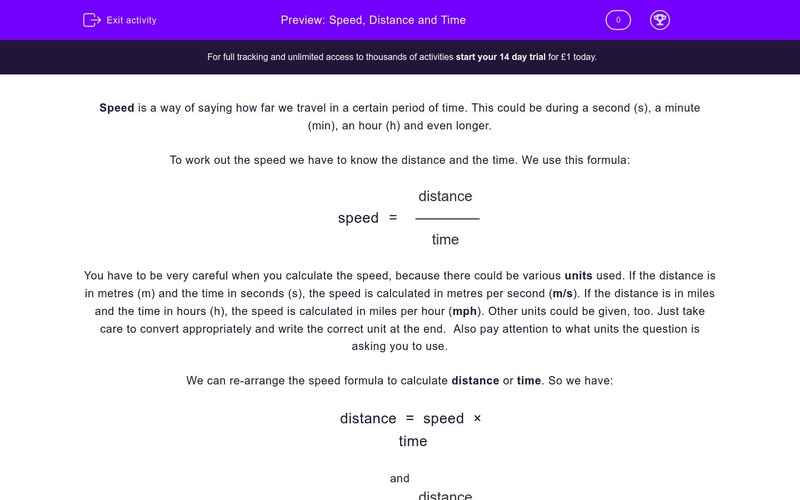 In this worksheet, students will practise calculating speed and what affects it. Speed is a way of saying how far we travel in a certain period of time. This could be during a second (s), a minute (min), an hour (h) and even longer. You have to be very careful when you calculate the speed, because there could be various units used. If the distance is in metres (m) and the time in seconds (s), the speed is calculated in metres per second (m/s). If the distance is in miles and the time in hours (h), the speed is calculated in miles per hour (mph). Other units could be given, too. Just take care to convert appropriately and write the correct unit at the end. Also pay attention to what units the question is asking you to use. When drivers see something on the road, it takes them some time to brake. The distance travelled during this time is called thinking distance. After braking, the car travels a certain distance before it finally stops; this is called braking distance. The total of those two is the stopping distance. The stopping distance depends on the initial speed of the car. Below you can see a distance-time graph. Study the different parts of the graph carefully. How do we do calculate speed? Calculate the speed if the distance is 10 m and the time is 2 s.
Calculate the speed if the distance is 2 m and the time is 0.5 s.
Calculate the speed in m/s if the distance is 2 km (1 km = 1000 m) and the time is 100 s.
Calculate the distance if the speed is 50 mph and time is 180 min. Calculate the time if the distance is 50 miles and the speed is 10 mph. How long will the stopping distance be if the thinking distance is 5 m and the braking distance is 35 m? A car stops totally after 100 m. The thinking distance was 20 m. What was the braking distance? The distance-time graph shows how far a car travels during a certain time. It also gives information about the speed. What can you tell about the speed when the line is straight and flat? What information do you get from the graph when the line is straight and going up? Speed equals distance over time. 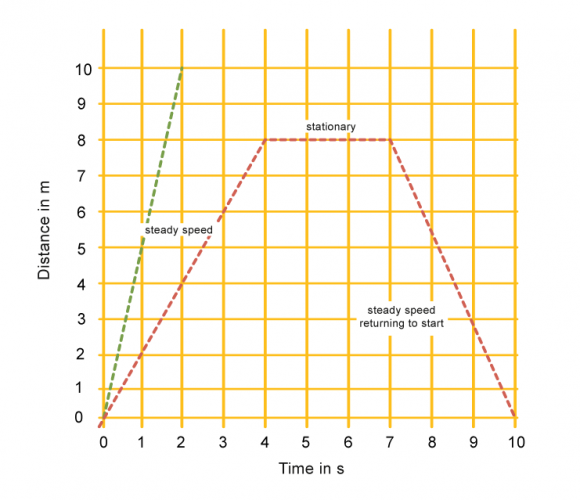 Speed equals distance over time, 10 over 2 equals 5 m/s (metres per second). Speed equals distance over time, 2 m over 0.5 s, 4 m/s. Speed = distance/time = 2000 (m)/100 s = 20 m/s. Note that I had to convert km into m first, because I was asked to calculate the speed in m/s. The speed is given in mph so we have to convert the time from minutes to hours before calculating distance. 1 hour has 60 min, so 180/60 = 3 h. Then, distance = speed x time = 50 x 3 = 150 miles. Time = distance/speed = 50/10 = 5 h.
Stopping distance = thinking distance + braking distance = 5 + 35 = 40 m.
Braking distance = stopping distance – thinking distance = 100 – 20 = 80 m.
When the line is straight and flat the vehicle is not moving; the speed is zero. When the line is straight and going up, the speed is steady and the vehicle is moving away from the starting point.